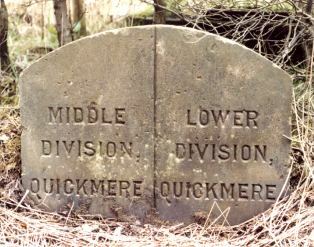 Quickmere is one of the ancient hamlets, estates , quarters, or even constablericks of Saddleworth in the Upper Division of Agbrigg Wapentake, the West-Riding of Yorkshire, Parish of Rochdale ( well it was in the 1850s. Now, since 1974, incorporated into Oldham Metropolitan Borough). Friarmere ( or, ever earlier, Hildebrighthope) An estate given, in 1292/3, to the Friars of Roche Abbey, near Rotherham. They had a house at Grange near Delph. Friarmere is the northern part of Saddleworth, the area to the north of Delph, encompassing Denshaw and the Castleshaw valley. Lordsmere , A large estate on the eastern side of Saddleworth encompassing Diggle, Uppermill and East Greenfield ( and the old Hamlet of Saddleworth). 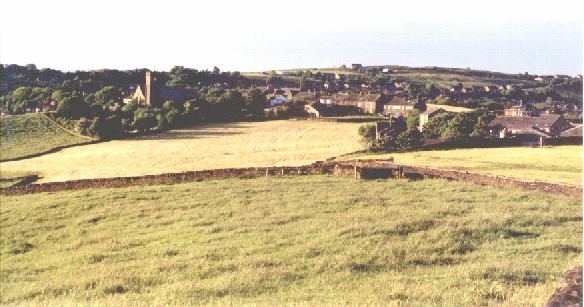 Shawmere, The central southern estate of Saddleworth containing Friezland, West side of Greenfield (Frenches) and reaching up towards Delph. Although under the control of Oldham and with Oldham postal addresses, Quickmere, and the rest of Saddleworth, is still technically in the county of Yorkshire though not for any administrative purposes. Saddleworth (comprising some 18,796 acres) is about midway between Manchester and Huddersfield (some 12 miles from each) and 9 miles from Rochdale and comprises many villages nestling in the Pennine hills. Until 1853 the township of Saddleworth was officially know as 'Quick' and Saddleworth was a hamlet within the township. Quick itself can be traced back to the Domesday book appearing as 'Thoac' or 'Tohac' with Roger de Poictou being recorded as owner about this time. Around 1150 the manor passed to the Stapletons though there appears to have been no manor house build within Saddleworth (Quick). Robert de Stapelton granted the Hildebrighthope estate to Roche abbey in 1292/3. 1584 sees the Manor of Quick, in respect of court leet, declared to be a part of the Manor of Almondbury (Huddersfield). Passing from the Tunstall family of Thurland Castle (or, maybe, the Ramsdens of Longley (Huddersfield) ?) to William Farrer of Ewood (Mytholmroyd) in 1654 for £2950 the estate was finally sold by James Farrer to the majority of the tenants in 1791. Quickmere is the eastern edge of Saddleworth, with its eastern border being the old county boundary with Lancashire. It was divided into ..
Lower division (Lydgate and Quick Edge) 1037 acres 1 rood and 28 perches. In 1864 the Springhead Local Board of Health was formed taking the Middle division of Quickmere under its control (becoming, in 1894 the Springhead Urban District) with the Mossley Local Board of Health taking the Lower division. In 1885 part of the Lower division came under the control of Mossley Borough (along with a slice of Cheshire and Lancs), becoming, in 1889, wholly part of Lancashire. By 1899/1900 the Uppermill Local Board merged with the rest of Saddleworth to become the Saddleworth Urban District Council and the Meres consigned to history. In 1937 Springhead Urban District became part of Saddleworth Urban District and in 1974 Saddleworth Urban District became part of Oldham Metropolitan Borough. The name of Quick now survives in the Hamlet of that name (SD975037) and Quick Edge, a Spur of High land (aprox 300 m) some ½ km to the East which drops steeply to Quickwood, Mossley and the river Tame below. Quick Edge road is a ridge road of antiquity (some say pre Roman) though now relegated to an unsurfaced track. Stockport - Doctor Lane Head Toll Road (Other Saddleworth Toll Roads) - Hmm these sites have disappeared!, shame, they were interesting!